Do you need a mobility scooter that gets you there fast? Then you need the Pride Victory Sport! This rugged, high-performance personal scooter boasts top speeds of 8 mph and an impressive 11 mile range-per-battery-charge. With 350 pounds of user weight capacity, a sealed transaxle drive train, and solid flatproof tires, the Victory Sport is built to last - plus, the standard high-back reclining seat makes every trip comfortable! Transport and stow your scooter without headaches, thanks to Pride's own one-handed feather-touch disassembly method. Call today to order your very own Pride Victory Sport mobility scooter! The Pride Victory Sport scooter is available in 2 colors and has all the features you want in a mobility scooter. Featuring a revolutionary one-touch disassembly, you can quickly and easily take this scooter apart. 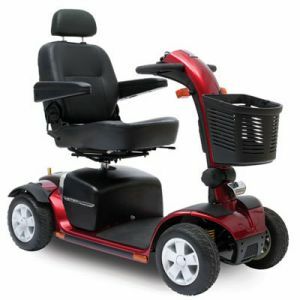 When it is together, however, you will notice the lightweight and low profile back wheels, lightweight seat with foam inserts to add stability, and Delta tiller wraparound handles. Travel safely in low light conditions with the Victory Sport's high-intensity LED path lights, and make sure your scooter is always charged with an easy access tiller-mounted charger port.